It was the last night of summer, and we needed to mark it somehow. So I and the wife and the lads went to see one of the big blockbuster films that we'd not quite gotten around to seeing over the course of our busy summer. Dawn of the Planet of the Apes had gotten decent reviews, and I'd enjoyed the first one, so I found it playing at a nearby twenty-two-plex that I wasn't even aware existed. Ah, the joys of living in a huge metro area. We piled into the car, and off we went. We got a large refillable popcorn and one large refillable soda between the four of us, and with our bucket of carbs and fizzy fluid, we settled in for the last gasp of summer. The film itself was solid, and a better bit of cinema than its predecessor, Rise of the Planet of the Apes. I found it completely enjoyable, and a good bit of storytelling. It wasn't perfect, as it got a tick overblown and overlong at times. Most notably, it shared the primary "flaw" of the first film in the series: The humans just weren't very interesting. It wasn't as noticeable as the first film, where the performances by the human characters were flat and formulaic. There, we were stuck with James Franco sort of phoning it in, and...what...the guy who played Draco Malfoy? I can't remember much else. 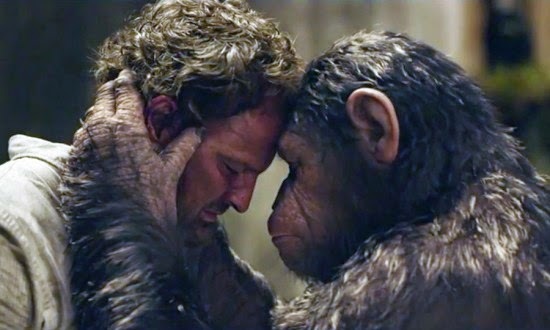 What you did remember were the apes, who were--despite being CG--compelling, emotionally affecting, and far more "human" than the humans. That was also true in the second film. The human actors did a better job, a solid, creditable job, but this wasn't their story. It was the story of Caesar and Koba, of Blue Eyes and Ash and Maurice. Sure, there was good and evil, trust and betrayal, justice and the dark selfishness of power. Homo sapiens sapiens wasn't the focus of the tale. We weren't the point. Which, I think, is generally true of creation. Oh, we can be part of the purpose of all sentient life. We can participate in it. We can choose to be aware, and connected, and creative, and kind. We can seek knowledge, and justice, and then transcend justice with grace. Or we can choose not to, as we do, more often than not. But what we should never do, not ever, is imagine that we're as important as we think we are.